The days of long run traditional printing businesses have passed – as buyers look for shorter run, digitally enhanced solutions on an almost on-demand basis. Translating entrepreneurial insights into a blisteringly clear, actionable Sales and Marketing plan for your team and you to follow. 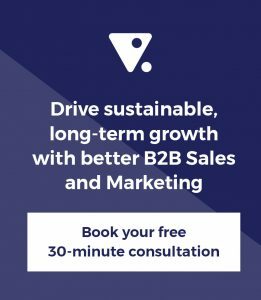 This SME blog shares insights on how to tackle these challenges, using proven Sales and Marketing performance tips – helping accelerate the growth of your SME business. Leverage and understand Geoffrey Moore’s Chasm Theory to determine where the bulk of your buyers are, giving you insight on how to maximise profits in the most competitive markets. Crossing the Chasm succinctly captures the evolution of buyer groups in response to technological change. In the early market, a small number of diverse, market leading buyers seek to be the adopter of new innovation. Price and completeness of functionality are overshadowed by the drive for competitive advantage. As markets mature, small groups of pragmatic buyers emerge. These early segments have moved beyond competitive edge, to demonstrable ROI from other like business in their segment. As more of these segments present and buyers adopt, the world starts to get very interesting for vendors, a tornado of technology adoption takes place – “from who and how fast” are the buyers catch cry. As the tornado subsides, the market reaches a state of maturity, functional and or technical buyers begin to dominate the purchasing process, driving down vendor prices and cherry picking the solution elements from multiple vendors. While Chasm Theory describes the buyer adoption curve for technology innovation, the strategic insights are profound for vendors. In a nut shell, it’s vital you understand where the bulk of your buyers are for the solutions that you and your direct competitors offer. Only then can you determine your solution approach, market focus, channel strategy, and competitive strategy. Use portfolio planning techniques to assess industry attractiveness and your businesses strength to optimise your go-to-market strategy. With market clarity drawn from Chasm Theory, you are now positioned to execute the next performance tip. In B2B selling environments, buyers make decisions based on the business problems they face. As the seller, you need to try to ‘tease out’ and prioritise these problems to identify those that are compelling, those where your buyers will pay a premium and where you have greatest relative strength. Firstly, come up with a long list of buyer problems you in your industry. Consider how attractive they are for you to focus on: i.e. the maturity of buyers in that market, the total revenue available, the number of competitors you face, and the profit margins vendors make. Then consider how well you solve these problems. Evaluate your brand position, your completeness of solution, your reference-ability and any cost and or technology advantage you hold. Bring the team together to create a buyer centric strategy and include the sales funnel velocity you need to meet your sales objectives. Then identify the right mix of Marketing and Selling tactics to progress your buyer through the sales funnel at this velocity. In two global studies into Sales and Marketing alignment, we asked business leaders from around the world to share their growth planning experiences. In 2005 and then again in 2014 the results were consistent, those businesses that workshopped their growth plan together, significantly out-performed their non-aligned industry competitors each year. In our work with leading Australian SME’s we see this repeated over and over each year. While entrepreneurial vision and drive is always needed for SME’s to survive, harnessing the collective input and buy-in of the entire SME leadership team are required for accelerated growth. The Sales and Marketing tactics that will get you there. If this sounds like a challenge then take heart. We’ve have been assisting SME leaders like you to make these decisions deliberately for over 14 years. To make this easier, we have developed a new Sales and Marketing software, Funnel Plan that helps you strategically map out your target, problem, velocity, tools, and tactics. We also offer a range of whitepapers and consulting support.